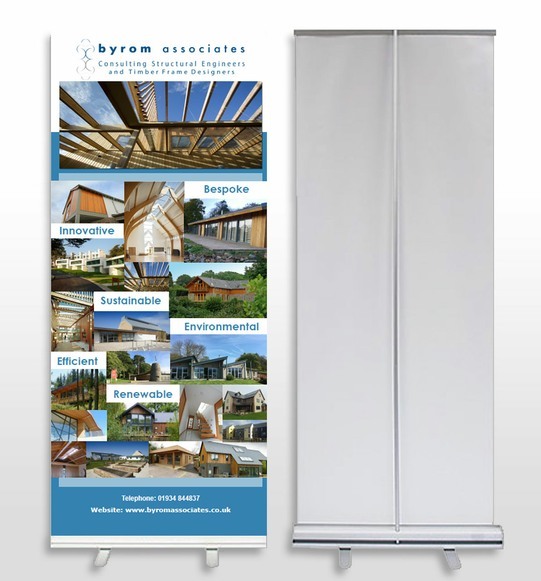 POP-UP BANNER DESIGN AND FLYER DESIGN FOR BYROM ASSOCIATES TO USE AT EXHIBITIONS AND PROMOTIONS - IN-KEEPING WITH WEBSITE BRANDING..
Byrom Associates is a structural engineering consultancy who provide professional design services for self-builders and small local builders through to large contractors and national timber frame manufacturers. Formed in 2002, we have a wealth of experience in all types of building structures ranging from home extensions and conversions to large residential estates, multi-storey apartments and schools utilising all four major construction materials. 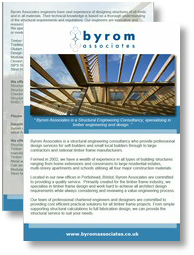 Located in our new offices in Portishead, Bristol, Byrom Associates are committed to providing a quality service. Primarily created for the timber frame industry, we specialise in timber frame design and work hard to achieve all architect design requirements while always considering and reviewing a value engineering process.